Several children in the Primary III classroom worked together to make Lemon Blueberry Scones. Our Primary classrooms are comprised of chldren from ages approximately 2.9 years old through 6 years old. The students made the scones for the school's neighbors, as a thank you to them for being very patient during the time our playground renovations were happening. The Primary III children were very understanding about not being able to try the scones themselves and even said, "these are for our neighbors to thank them. They are not for us!" Mix together all the dry ingredients, including the lemon zest and blueberries. In a separate bowl, mix together the egg and sour cream. Cut the butter into 1 tbsp squares, and add to dry mixture. Use a pastry blender until mixture resembles course crumbs. Add sour cream/egg mixture until incorporated. If it is too wet (which ours was), add flour 1 tbsp at a time. We used 1 heaping tbsp, 1 inch apart, and baked for 10-12 minutes at 350 degrees. To make a glaze, mix 1/2 cup powdered sugar with 3 teaspoons lemon juice and drizzle on top of scones when cool. We hope you'll try this recipe and enjoy making it as much as we did! In preparation for our cultural trip to France, the art studio has been abuzz with conversations about the evolution of European art towards French Impressionism. We will be visiting The Louvre, the Musee D'Orsay, and possibly the Pompidou Centre. We have discussed in depth, the Mona Lisa, and Leonardo Da Vinci, the story of The Raft of the Medusa, Liberty Leading the People, Vermeer's the LaceMaker, and the transitional painter Eduard Manet and his 'shocking' Luncheon on the Grass. The students are very ready to visit Giverny, the home and studio of Claude Monet during the last 40 years of his life. We have seen how the march forward in painting was bumpy and difficult in mid-century Paris. The Impressionists changed the way artists worked (outdoors en plein air, looking at the ordinary life of people and scenes in nature, exploring light and color, optical mixing using separated brushstrokes, and more). The excitement of the stories and art of Monet, Renoir, Degas, Cezanne, Morisot, Cassatt, and others has been very satisfying! We are also prepared to see the wildly unusual paintings of Arcimboldi, the enormous canvas of Napoleon's coronation by David, and so much more. Before we leave for France, students will see a presentation about the life and work of Vincent Van Gogh and his relationship to Paul Gauguin. A special exhibit of Van Gogh's paintings, drawings and letters will be on display at the D'Orsay while we are visiting! Learn more about our Montessori art program. The Renaissance International School is a Montessori school in Oakland's Dimond district. Students from Oakland, Berkeley, Alameda, Moraga and other east bay cities and towns attend the school. We have a strong music, fine arts and French and Spanish language immersion program. We have been cooking up many delicious recipes in our classrooms. 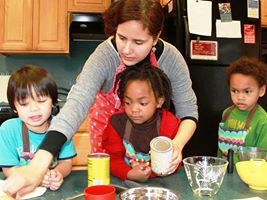 Cooking activities provide students with skills in academic areas such as math and science as well as offiering insight into different cultures. Providing children with an international and multidisciplinary experience is one of the founding principles of The Renaissance International School. Our school is an international community of teachers, students, and families. .Preheat oven to 375°F Grease a 9 inch by 13 inch pan. Mix the vegetables together in a medium sized bowl. In a smaller bowl beat the eggs with the seasonings. Add the egg mixture to the vegetables. And the matzo meal, and give it one final mix. Bake in oven for 45 minutes and serve warm. We hope you'll try this at home. Our Primary II students are learning about the midwestern portion of the United States and have been discussing a variety of topics related to the middle of our nation. They have learned that the climate there has extreme temperature changes. Hot in summer and very cold in winter. One of their teachers is from the Midwest and she told them a science experiment to try in very cold weather is to take a hot cup of water outside, throw it in the air and it will turn to snow before it touches the ground. 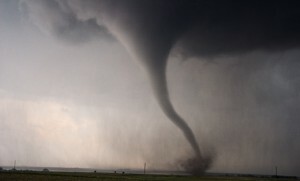 Tornadoes are another Midwest phenomena that the children learned about. We spoke of how the warm and cool air come together and move in such a swift manner that it can lift things from the ground. One can see it spiraling, much like the water in our toilets, but with air. They heard that just like we prepare for being safe by practicing earthquake drills, in the Midwest all children do the very same thing to prepare for a tornado. They crouch down and cover their heads. Instead of getting under a table as we know to do for an earthquake, they find a place away from windows to stay until the storm passes. In addition to tornado drills, we also learned about the Mississippi River, the longest river in North America. It starts in Minnesota and flows all the way to the Gulf of Mexico. The river barges move along the Mississippi River, very gingerly in certain places. 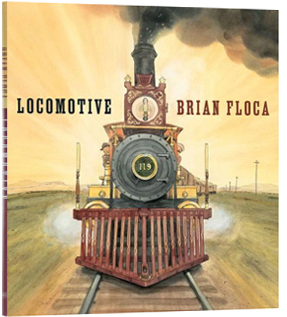 The children learned that the first boats to travel the Mississippi had steam engines, just like the early locomotive. Our children are all aboard with their learning and continuing to grow. In fact, earlier this week, one of our students paused while eating his lunch and said to his teacher, "We are getting soooo big." Learn more about our Montessori program for students ages 2 years old through middle school. Register for one of our tours. Take a tour of The Renaissance International School and you will see a beautiful mural on the outside of our music studio building. The mural was created this past summer at our Mural Camp. It was created in three weeks by 25 children, two teachers and two assistants who worked together to create it. The wall that the mural is painted on is 18 feet long and 10 feet high. The process to create the mural involved prepping and priming the surface. 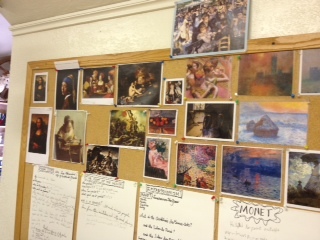 The group also researched other murals for ideas, agreed on a plan, made drawings and sketches, mixed paint, and applied paint using many techniques. All of this was done in the heat of summer, while surrounded by campers playing volleyball, basketball, and working on carpentry projects. The subject of the mural is California’s threatened and endangered species. The group found 20 animals and one tree that both the Federal Government and the State of California agree is either threatened or endangered. The names of the animals (and the tree) are written all around the border of the painting, providing the viewer with the opportunity to play a game of name-identification. We are very proud of our work. It is beauty and learning all rolled into one experience!